The history of obwarzanek krakowski dates back to the Middle Ages. The first known mention of it dates back to 1394. In the financial books of the King Vladislaus II Jagiełło and Queen Hedwig’s court, it had been noted: “For the queen pro circulis obrzanky 1 grosz”. The name “obwarzanek” refers to its production process and derives from “obwarzać” (to parboil), a distinctive technique of boiling the dough. The Latin names, circulis and circinellos, refer in turn to the obwarzanek’s round shape. The production of the obwarzanki (plural of obwarzanek) is traditionally done by bakers. At first, they had been baked only during Lent. In 13th century the bakers’ guild was created in Krakow. Back then, the obwarzanki could only be made inside the city walls by specific bakers who were allowed to sell them in the bakery stalls around Sukiennice on the Main Market. The production and selling of the obwarzanki had been carefully monitored by the members of the guild back then, but it’s likely that from the mid-19th century any baker could make them. Up until the 1950s, the obwarzanki were sold from linen-lined wicker baskets. 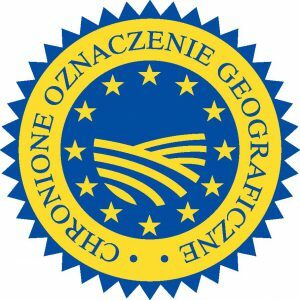 The obwarzanek has been awarded the status of Protected Geographical Indication (PGI). In 2010, the European Commission recognized that this round dainty is a part of culinary heritage of Krakow as well as the tradition of the city. The certificate strictly determines the weight, shape and the production process of the obwarzanki, and it can only be given to the bakers from the city of Krakow or Krakow and Wieliczka counties. Obwarzanki krakowskie are well-liked, and both the locals and the tourists appreciate their taste. They are available for sale right from the special street carts that can be found on nearly every street corner. It’s worth noting that the authentic obwarzanek has particular, longitudinal marks from the baking process on the bottom. The mass-produced fakes have little round shapes there instead. In 2010, the obwarzanek has been added to the list of Protected Geographical Indication (PGI) by the European Commission. The certificate strictly determines the weight, shape and the production process of the obwarzanki, and it can only be given to the bakers from the city of Krakow or Krakow and Wieliczka counties. The Protected Geographical Indication (PGI) status is granted to regional products from a specific area, on a condition that at least one stage of its production takes place in that particular area. In the case of the obwarzanek krakowski, the entire production must take place in the city of Krakow or Krakow and Wieliczka counties, but, for example, the flour used in said production may come from another part of Poland. To be granted the right to use the EC conformity mark, the producer has to prove the compliance with the directives and receive a certificate.